*2. 51,883　*,*51,883　Momoiro Clover Z "The Golden History"
*5. 14,571　1,192,340　AKB48 "LOVE TRIP / Shiawase wo Wakenasai"
11. *6,364　*,104,099　EXILE "Joy-ride ~Kanki no Drive~"
12. *6,000　*,821,893　Nogizaka46 "Hadashi de Summer"
13. *5,946　*,285,457　SKE48 "Kin no Ai, Gin no Ai"
17. *4,962　*,**4,962　Cheeky Parade "Hands up!" 19. *4,178　*,373,370　SMAP "Arigatou"
30. *2,490　*,*59,290　Namie Amuro "Hero"
44. *1,671　*,*12,930　Ikimono-gakari "Last Scene / Bokura no Yume"
46. *1,558　*,*18,561　Hiro Shimono "ONE CHANCE"
56. *1,256　*,*33,219　Team Syachihoko "ULTRA Chou MIRACLE SUPER VERY POWER BALL"
62. *1,099　*,175,944　NEWS "Koi wo Shiranai Kimi e"
70. *1,000　1,623,109　SMAP "Yozora no Mukou"
77. **,842　*,*19,276　Aimer "Choucho Musubi"
79. **,826　1,567,607　SMAP "Lion Heart"
81. **,781　*,*37,838　EXILE THE SECOND "Shut up!! Shut up!! Shut up!!" 83. **,766　*,183,765　SMAP "Otherside / Ai ga Tomaru made wa"
*6. 13,566　*,*13,566　Suzuko Mimori "Toyful Basket"
*7. 10,222　*,*10,222　Sora Amamiya "Various BLUE"
*8. *6,529　*,**6,529　GLAY "BEAT out! Anthology"
10. *4,530　*,255,902　Kana Nishino "Just LOVE"
13. *3,907　*,**3,907　Gacharic Spin "Kakujitsu Hendou - KAKUHEN-"
14. *3,823　1,818,784　SMAP "Smap Vest"
17. *2,918　*,124,275　Spitz "Samenai"
19. *2,265　*,188,685　Kobukuro "TIMELESS WORLD"
26. *1,702　*,352,032　SMAP "pamS"
30. *1,519　*,*66,815　Ayaka "THIS IS ME ~Ayaka 10th anniversary BEST~"
36. *1,316　*,284,758　Ikimono-gakari "Chou Ikimono-gakari~Tennen Kinen Members BEST Selection~"
38. *1,250　*,588,624　Miyuki Nakajima "Singles 2000"
42. *1,177　*,**4,599　King Creamsoda "Radical Action ~Live in Japan + More"
47. *1,088　*,**1,088　MAGIC OF LiFE "X-1A"
55. **,952　*,117,947　Walküre "Walkure Attack!" 58. **,906　*,287,544　Hey! Say! JUMP "DEAR." 67. **,843　*,198,781　ONE OK ROCK "Niche Syndrome"
72. **,786　*,**4,858　Kana Hanazawa "KANAight ~Kana Hanazawa Character Song Hyper Chrinicle Mix~"
85. **,660　*,894,779　"Yumi Matsutoya 40th Anniversary Best Album Nihon no Koi to, Yumin to." 89. **,609　*,756,690　Spitz "CYCLE HIT 1991-1997 Spitz Complete Single Collection"
95. **,561　*,621,575　SMAP "SMAP 015 / Drink! Smap!" The OP is still way ahead of Aqours 1st and 2nd singles, even though it had almost exactly the same first week sales. The other thing is that the Aqours 1st and 2nd singles had "release event ticket serial codes" bundled on them (not "live concert event tickets serial codes"), and yet the anime OP is outselling them at the same point in time. Clearly, the "release event ticket serial codes" did pretty much nothing since buyers were already going to buy the singles in the first place. The increase in sales, seems to be because the buying fanbase has grown since the anime started airing, which is what I expected before the anime started airing. Other Love Live! related sales. It makes me wonder what the Top 300 album threshold was this week, because it seems weird that even the μ's Best Album Best Live! Collection II album failed to chart this week. Poor Mimorin. Big drop from her previous album, but Fantastic Funfair did have the 2nd live 2015 event ticket serial code bundled on it. I guess these sales aren't too bad when we consider that. Something about that Momoiro Clover Z cover art rubs me up the wrong way. Decent first week sales for TK, not his best single so far for me (I prefer his band work) but good nonetheless. Also wasn't aware the Saiki OP was out. Got to get it as it's so catchy. 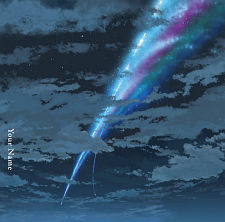 Wow, Your name ost selling great! Can I buy it from CDjapan? I bought it from CDJapan. Really fast shipping and a kinda reasonable price. Haven't watched 'Your Name' yet, but Radwimps albums are always a must buy. Limited edition is out of print in all stores, pretty amazing as most limited editions are not really limited but this one really is gone. w-inds. latest single die down so fast. Wow, Kimi no Na wa. OST sold well 3 weeks in a row!